I have been expressing a desire to depot my UD Book of Shadows Vol. IV for awhile now. After purchasing this magnetic palette, it finally came time for me to get on with it. It was surprisingly much easier than I thought. I armed myself with tweezers, scissors, exacto knife, hair dryer-all the tools I have seen in the YouTube vids. Really I only needed the knife, scissors, and some arm strength. 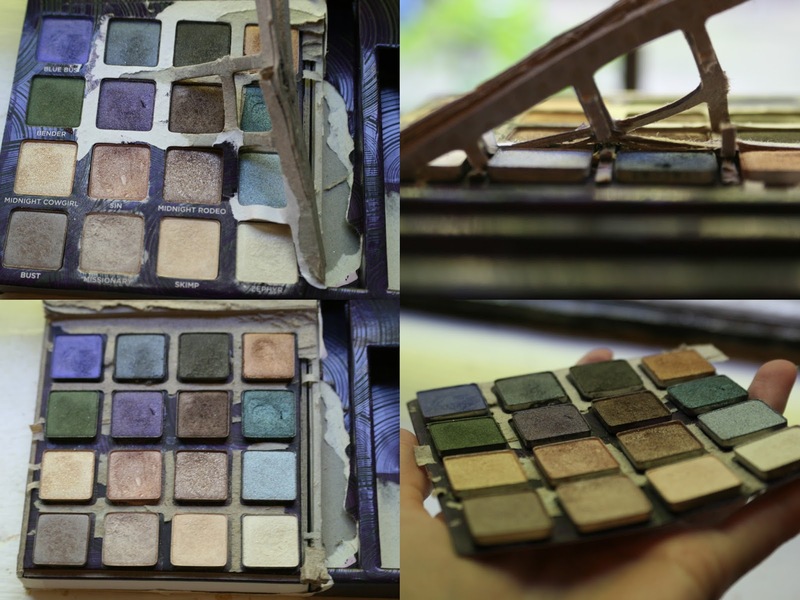 Warning: This post contains pictures of palette destruction. The Book of Shadows is a clunky cardboard box. I really didn't know where to start. After I pulled out the drawer of shadows, I just started ripping off the paper. I was a bit nervous. I really didn't want any eyeshadow pan casualties. The point of depotting it was to get more use out of them. I discovered that the cardboard was layered around the pans and just kept at the ripping and using the exacto knife to pull more layers. Once I had a nice thin sheet of cardboard, I cut out the little squares with the scissors. It was fairly easy to peel it off the pan at this point though that adhesive was strong! I will admit there is still some left on the backs. Finally, I was left with sixteen little pans of eyeshadow, ready to be put in the palette. They magnetized right in, no extra sticking needed. Now, I can rearrange them in any order and actually use them, instead of leaving them in their gigantic cardboard box. Have you depotted any of your make-up?